I had a Mother’s Day Weekend, complete with getting dolled up and going out on the town with my friends Friday night. Saturday, I didn’t go to the movies like I intended to, but I did get to go to a luncheon for my chapter’s mentoring program and was so pleased with how it turned out and got to take some leftovers home so I didn’t have to cook. 🙂 And I always get giddy when petit fours are involved. Lol! Yesterday was a great, relaxing day, and I truly needed it. As busy as a beaver as I can get, it’s nice to just lie around all day (and only get up for a massage and facial and to eat!). 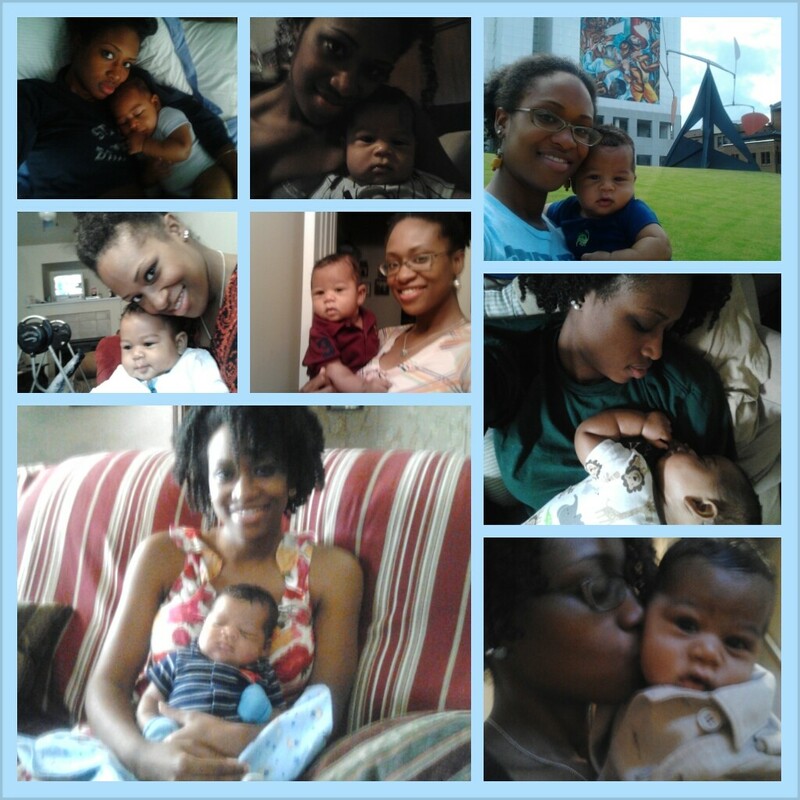 While I was lying around, I thought a lot about my first year of motherhood, which will be complete in just a month. I’ve learned a lot about myself and about life. I appreciate my mom 1,000 times more than I ever have because now I understand first hand the magnanimity of her love for her children. And I’ve finally shed the majority of the shame I’ve felt for being a single mother. Here are a few of the lessons I’ve gained. As long as I am taking good care of Frederick, I will be taken care of. Help has come from unlikely places since I’ve become Frederick’s mom. I have not suffered. When various situations come up, I’ve had help from family, friends, neighbors, and even strangers. I ended up having to go to the ER a couple of weeks ago, and a stranger saw me pulled over on the side of the road and called my neighbor for me. THEN she actually rode with my neighbor back to the house and brought her back so that she could drive my car. And my neighbor stayed with me until late because she cared. They say God takes care of babies and fools, but I’d like to add to that devoted mothers. My mom used to tell me often while I was preggo and uber depressed and worried that as long as I took “good care of that baby, God will take care of you.” And she was so right. Help may not come the way I expect it, but it will come. I’m in control of my own happiness. I can choose where to focus my focus. Sure, I could easily spend my time thinking about what the ideal situation looks like and how that’s not my reality. I did that for nearly 9 months. I beat myself up for spending my life trying to be stellar then becoming an unwed mother at 30. I punished myself for taking a chance on love despite a not-so-great track record. I battered myself for allowing myself, who has always been seen by others and by my own self as strong and above the fray, to be emotionally abused. And then with help from my mother, my pastor, and my therapist, my maternal instincts kicked in and made me snap out of it. I couldn’t be good for Frederick as long as I was waist-deep (maybe neck-deep!) in self-denigration. The world can beat you down, but I don’t think anyone can kick you while you’re down like you yourself can. When I stopped beating myself up and started choosing to focus on my blessings instead of my challenges, the sun came out again. When I started allowing myself to see the silver linings to the blackest clouds in my sky, I started becoming way more productive and hopeful and ready to accept more positivity in my life. When I stopped constantly wishing people understood my plight, my plight became a lighter load. And heck, when I started realizing that certain people are just too selfish to care about anyone but themselves, I stopped wasting my energy on them. I realized that I don’t have to answer every text message, email, or phone call. If you send me something negative, I don’t have to answer–it’s my choice to ignore it and keep it moving. For as many people have something negative to say, there are at least two who have something encouraging to say. And that’s who I choose to listen to now. It doesn’t matter who didn’t wish me a happy Mother’s Day–I was beyond ecstatic over the cards, Edible Arrangement, breakfast (and my coffee was sweet! ), gifts, and super sweet text messages that I did receive. I’ve learned to fill as much space as possible focusing on the goodness in my life. Life is a journey, and I still have a long way to go before I’m where I want to be spiritually and emotionally, but I thank God and all the heavens that I’m not where I was a year ago. Being a mother is the toughest job I’ve ever had, but it is by far the most rewarding. I never knew I could love someone as much as I love my son. I’ve always considered myself a loyal, protective, giving person, but nothing I’ve ever done for anyone compares to what I have done and will continue to do for my little one. And as much as I give to him, I receive back. I say at least once a week that Frederick has made me Wonder Woman. I get amazed every time I learn something new about my post-baby self–physical, emotional, etc. About a month ago, I went rock climbing for the first time and was able to climb 5 courses–I used to not be able to pick up my little TV/VCR combo without feeling super strained. Now I’m Spiderman Jr. And it wasn’t a fluke–last week, I went to hot yoga for the first time since I learned I was preggo. Halfway through the second class, the instructor told us “we are about to practice handstands” and I looked at him like he had lost his mickeyfickey mind. Then he explained that it’s a process with steps and once you find which step makes you strain, you stop and that’s what you work on. So, okay cool–nowadays I’m willing to try. I got about halfway through the steps before I had to stop. Meaning I was able to prop my feet on the wall and extend my legs. I was very very surprised and proud of myself. The fact that I can put so much of my body weight onto my arms is fascinating to me. (But I guess that’s what happens when you constantly tote around a healthy, solid baby!) It also surprises me how easily I can let go of the small stuff now. I used to be a stickler for making things be how I think they should be, and now, it really has to be major to get a rise out of me. I like that about myself. Having Frederick has taught me the importance of reserving my energy for what is really important to me instead of wasting it on non-factors. Don’t get me wrong–I can still get crunk from time to time, but I’m definitely not fighting every little battle there ever was anymore. So that’s that. I hope every mother had a wonderful, relaxing, loving Mother’s Day yesterday! We deserve it!